redevelopment in Salt Lake City. Magnusson Klemencic Associates earned the top honor in the 45th annual Engineering Excellence Awards, held by the Washington state chapter of the American Council of Engineering Companies on Jan. 18 at the Westin Bellevue. ACEC Washington honored 43 projects representing a wide range of engineering achievements. The top four awards (one platinum and three gold) will go on to compete in the ACEC national competition in Washington, D.C., in April. 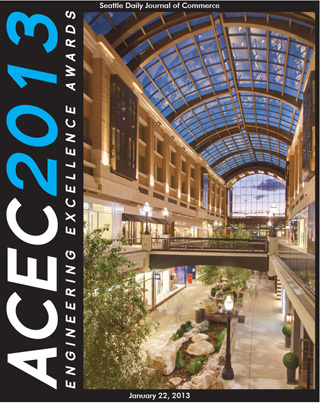 MKA earned the top prize for its structural engineering work at City Creek Center in downtown Salt Lake City. The project involved working with three architectural teams to preserve or construct more than a dozen buildings and tie them together in a 23-acre, 5.5 million-square-foot redevelopment in a seismically vulnerable area. Members of the five-judge panel were Larry Hurlbert, CEO of Integrus Architecture; Linda De Boldt, deputy director of Seattle Public Utilities; Jim Duncan, past board chair and president of the Seattle Architecture Foundation; Ray Steiger, director of public works for the city of Kirkland; and Jon Silver, a reporter at the Seattle Daily Journal of Commerce. The American Council of Engineering Companies of Washington is a professional trade association representing consulting engineering, land surveying and affiliated scientific and planning firms statewide. (operating as City Creek Reserve) and its equity development partner, Taubman.